In 1975, a cranky Arkansas scribbler named Kurt Saxon launched a newsletter called The Survivor, and it was in its pages he later claimed to have coined the word survivalist. “My definition of a Survivalist,” he wrote, “is a self-reliant person who trusts himself and his abilities more than he trusts the Establishment. Insofar as the Establishment is deteriorating, the Survivalist prepares to leave it.” This being America, however, there was a fork in the road to self-reliance. In the ’60s and ’70s, large numbers of peace-loving youth had retreated from the economic mainstream, preferring to tread lightly as back-to-the-landers. They took their cues from Thoreau and, later, Scott and Helen Nearing, whose writings made Vermont a popular destination. After September 11th, cataclysm seemed more and more plausible, and “preparedness” became a buzzword. “Preppers” were like survivalists, only there were more of them. You didn’t have to head for the hills to be a prepper. All you needed was a stockpile of food, an emergency-preparedness kit and an above-average susceptibility to sensationalism. You might even end up on reality TV. Finding such pockets of freedom, in the wilderness or otherwise, was the objective of a wave of political-migration movements that emerged after 2000. Most centered on the sparsely populated Intermontane West, but the most successful one set its sights on New Hampshire. The Free State Project, which aims to bring 20,000 libertarians to the Granite State (enough, they hope, to affect political outcomes), is not overtly survivalist, but its adherents have in common with survivalists a notion of freedom that any 5-year-old can understand. 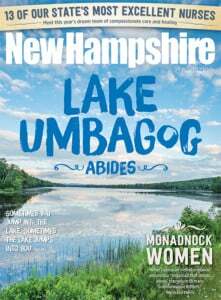 Liberty has become almost a brand in New Hampshire, with its rugged landscape, harsh climate, and inhabitants who prefer to be left alone, making it a potential preppers’ paradise. If Vermont, our flower-child twin sister, attracted droves of back-to-the-landers in its day, might a parallel culture of survivalists be hiding in our hills? Are there people here who would like to see the Granite State made over into a Granite Redoubt? Ten years ago, Tory and Laura Walls owned an excavation company on Cape Cod. When the recession hit, they lost everything. Bankrupt and living with Tory’s parents, the couple gambled on a fresh start in South Carolina. Life there, off the grid, played out in three small prefabricated sheds. Local preppers taught them to raise chickens, pigs and ducks. “We were saved in South Carolina,” says Tory. But in the end, the heat got to them. They returned to Massachusetts with a very large pig and a radically altered view of the world. A friend told them they should consider New Hampshire, where they might afford to live without debt. They scraped together enough to buy a decommissioned hydroelectric plant on 10 acres in Bethlehem. “As a prepper,” Tory says, “I’m thinking standing bomb shelter, root cellars.” Friends gave them an old camper, a woodstove and a pile of wet firewood. They moved to their new homestead in January of 2015, not an easy time to come to the North Country. When I first met them, the Wallses ran a preparedness-supply shop in Littleton. The business didn’t open until 3 p.m., because they needed the daylight hours to run their homestead and school their children. Tory, 40, had a strong build and spoke with a gruff Massachusetts accent. Laura was 37, had a wholesome midwestern look, and spoke with a milder version of Tory’s accent. “We have a hard time trusting,” Tory told me before agreeing to speak on the record. I looked around the store and saw dehydrated foods, gardening tools, seeds, barrels, trauma packs, Army T-shirts, steel body armor, camouflage clothes. On the wall were a modern American flag and a Betsy Ross flag. The possibility of a telecommunications interruption is a survivalist bugbear. Tory keeps his radio set in a homemade Faraday cage, a steel box covered in metal tape and lined with cardboard. He said everyone should keep their devices in such a protector, a precaution against electromagnetic-pulse attacks. Important how-to videos should be downloaded from YouTube, compressed, and stored here as well. Three rifles were prominently displayed atop a glass display cabinet: an AR-15 chambered in 300 Blackout; a Remington 700 chambered in 308 (“It’s a long-distance rifle,” said Tory. “I’m not going to say sniper rifle.”); and an SKS. Tory told me the AR-15 and the AK-47 are the staple firearms for preppers. He carried a sidearm while we spoke. Despite all the weaponry, however, debt is the shadow that looms largest for the Wallses. “Every year is a progression, and we own everything,” said Tory. Laura, meanwhile, recited a litany of the payments that hang over Americans’ heads: student loans, car loans, mortgages. “We don’t want our kids to grow up and have nothing,” she added. Protection of their son and daughter is central to their worldview. For Tory, the imperative extends to Laura. Tory agreed to take me to the homestead, while Laura minded the store. We drove along the Ammonoosuc River, which sparkled in the autumn sun, and turned into woods girdled in NO TRESPASSING signs. At the bottom of a long and rocky hemlock-shaded driveway was a goat pen hacked out of the woods. On the right was a vegetable garden, and beyond it a makeshift shooting range. Powerlines ran over the property, an intrusion of public life that irks Tory but keeps property taxes low. We were greeted in the sandy dooryard by Tory and Laura’s children, two dogs and a few goats. Tory talked sternly to his son, rebuffing his boyish questions with “Not the time.” The kid returned to assembling a bicycle from old parts. Tory later told me the boy, 13, had split most of their firewood the past two winters and that he can assemble an AR-15 in seconds, blindfolded. “We’re raising our kids to be contributing members of society,” he said, “not drains on it.” The daughter was curious, following us at a distance and making cute remarks. Now 10, she was pistol-certified at 8. They were sweet kids, affectionate to one another, with excellent manners. The homestead was a cross between a natural oasis and a construction site. None of the buildings looked habitable. A one-story concrete structure had graffiti on it: “Punk rock will never die!” On an inside wall was a painting of the Grim Reaper. This was the power plant’s former workshop, but for now it was the Wallses’ house. The cavernous interior served as their sole living area. It contained a master bed and a bunk bed. Between the two was a forge. The ceilings were high, the walls unadorned concrete. No sunlight came in. It felt cold. In one corner was a shower fed by a barrel of bleached river water. Tory was planning to build a cabin the following year, and this would become a workshop again, as well as a bible-study area. He’d like to set up a church here, and maybe a camp where young people would learn to live closer to nature. “You’ve got to protect your family,” he said. “Don’t you think Christianity demands pacifism?” I asked. He said he knew Jesus said to turn the other cheek, but added that he also said to sell your cloak and buy a sword if you don’t have one. “I’m not going to be meek,” he said. “The meek will inherit the earth,” I said. “I know, I know,” he said, and looked at the ground. When I hazarded that prepping seemed misanthropic, Tory countered, “I love people. I wouldn’t have you here if I didn’t. I wouldn’t have a store. Without people there’d be no community, no survival. A lone survivor in the woods? Good luck with that!” His voice was warm. When I visit the Wallses again in July 2018, I learn that they’ve closed the storefront in Littleton, wanting to put all their resources into making the homestead a success. The entire family is in high spirits, and their clearing in the woods teems with life. Everything is green. Where before I’d seen only the dogs, two pigs and a few goats, it seems now that Noah’s Ark had spilled its contents on the banks of the Ammonoosuc. The animals are mostly unconfined and act like members of the family. Tory and Laura have both taken part-time work, but they look forward to the day when this will no longer be necessary. They’ve held on to their licenses for the manufacture and sale of firearms and ammunition, and they hope eventually to run a retail business from here, alongside the earthier everyday activities of growing food, raising their kids and defending their property. The kids are looking after the immaculate garden, which is alive with lettuce, potatoes, peas, tomatoes, squash. As I regard the life multiplied around me, I see, abandoned in a far corner of the ever-expanding meadow, the camper where the Wallses spent that first hard winter. Sometimes I wonder whether some of us have a psychological need to learn American history the hard way — by reliving it, working our way up to the present from scratch. It seems, intentions notwithstanding, an inefficient way to live, failing as it does to exploit the advantages of scale and tradition afforded by society. Without today’s internet, Ian and his wife Jody doubt they’d be able to live the life they’ve chosen. They were early signers of the Free State Project’s pledge to migrate to New Hampshire, and they moved to tiny Croydon from suburban Philadelphia in 2007. They continued in their old jobs through a combination of telecommuting and regular trips south. With another Philadelphia couple, they settled on a large piece of rural land and established Bardo Farm, where they strive after a measure of self-sufficiency, sell produce (for which they’ll take cryptocurrency), and offer a place for curious liberty lovers to explore the skills requisite for an independent lifestyle. “It wasn’t a commune,” Jody adds. Ian and Jody are not survivalists in any usual sense. They exhibit a degree of sophistication not generally associated with the stereotype. Jody has a doctorate in education and a master’s degree in computer science. Ian is a mathematician who once worked for NASA. When it comes to politics, they don’t talk about “the government” when they really mean the state. Insofar as they are survival-oriented, it’s not fear that drives them. To them, fear represents an instrument the state uses to bully its citizens. The more we know how to do for ourselves, the less leverage the state will have. Learning even simple skills, such as cooking or removing a fallen tree from the driveway, is one way of seeking independence. “Spoken like a true native,” I say. “It feels more like home to me than any place I’ve ever lived,” says Ian. I first met the unforgettable Joel White at the foot of Mount Washington. I was 14 and one among a group of summer-camp kids he was to lead to the summit. I should have known he had survivalist tendencies, because survivalists have in common with 14-year-old boys a love of two things: pocket-size gadgets that do unlikely things of questionable practical value, and explosions. And on that day in the early ’90s, White had all sorts of tricks up the sleeve of his denim jacket. “Where’d you get that funny accent, Mr. White?” a boy from Connecticut asked. Now 60, White still wears waist-length hair and is built like a fireplug, a compact bundle of muscle that makes you take him seriously as a woodsman. His father died when he was 15, and he took over the family septic-pumping business. After five years, married now, he bought the business, as well as a mountaintop A-frame camp with no water, no electricity, and no septic system. He cut a driveway with an axe and rotated the A-frame to face south. Over the years, he’s brought in modern comforts and put on two additions, but the structures are built from wood harvested on the mountain and reflect White’s rustic eccentricity. Survivalist is a label White neither self-applies nor rejects. He values preparedness partly because of his environment: He and his wife, Bonnie, live on a mountaintop, where access can be difficult and winter sometimes lasts six months. But he’s also wary of the state and interprets the world in terms of biblical prophecy. Unlike many suspicious people, however, he’s buoyant and friendly and, in all the hours I spent with him, never badmouthed anyone — except the Antichrist. As a young man, White read the Bible cover to cover. “Once I figured out things were happening in threes,” he explains, “that helped me understand Revelation better when I got there.” He spent 20 years literally cutting a Bible into verse-sized pieces, collating all the prophetic passages on to a 7-foot timeline of the Apocalypse. Without this long view, he says, the Book of Revelation makes no sense. His main contention is that the rapture — the transportation of believers into heaven at Christ’s second coming, according to Evangelical theology — will happen near, but not quite at, the end of a strife-ridden 7-year period known as the Great Tribulation. “Here’s your seven years,” he says, launching into an explanation of a supplementary chart covering the fine details of the Tribulation. Then comes the War of Armageddon. The Tribulation, though, is what White and other literalist premillennial Christians worry about, since by the time Armageddon starts they hope to be gone. White’s description of events is a mash-up of cryptic biblical passages and flame-breathing Hollywood action. Filtered through his solemn phrasing and old-fashioned Yankee accent, the effect is like Jonathan Edwards giving his buddies an off-the-cuff review of “Independence Day” down at the bar. After he’s plucked an assault rifle from behind his chair, then fished out a waterproof survival model from behind the couch, he leads me up a Swiss Family Robinson staircase to show me the view from the bedroom. “These walls are so thick a bullet ain’t getting through unless they got .50 caliber,” he says, giving one a knock. From every nook around the bed he pulls out more firearms: a sawed-off double-barrel shotgun (made following federal rules on length, since New Hampshire doesn’t have any), a Yellow Boy lever-action rifle, a .410 that can fire hollow-point slugs or .45 Long Colt pistol rounds and, finally, a 12 gauge with a folding stock that looks like something Mad Max would pack. White traces his ancestry to Peregrine White, who was born on the Mayflower while it rode off Cape Cod. It’s not important whether he’s a literal descendant of the first New Englander. He believes it. Family tradition also says his mother’s side has Native American roots. His family has been in northern New Hampshire for longer than anyone remembers. But like the others in this story, they too were once newcomers, and it probably wasn’t long before they started bemoaning immigration from Massachusetts. It’s hard to put a finger on what makes New Hampshire distinctive. I once met a Westerner who said it and Maine were the only eastern states he felt comfortable in. Later, I had a summer job that sometimes involved crossing into Massachusetts. As soon as we’d hit the “Live Free or Die” sign at the border coming home, my boss would reflexively release his seatbelt and heave a sigh, as though he’d just sloughed his shackles. These two anecdotes go as far as anything in explaining New Hampshire’s uniqueness. “Live free or die” began as a revolutionary rallying cry, but on our license plates it sounds like an ultimatum, compelling a question: What are you supposed to do, in a country where freedom is taken for granted, when you’re commanded to “live free?” Clearly, you can’t just bask in it. You have to exercise your freedom. Unbuckling a seatbelt becomes a private declaration of independence. Discharging explosives in a National Forest is another. Could upping the ante on everyday life, raising it to survival, be a third?